The Bruery is locatated in Plactntia, CA and unfortunately they don't distribute or ship to Texas. 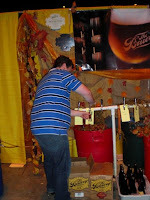 I was able to chat with Patrick Rue at the Great American Beer Festival and he gave me a sneak peak of Black Tuesday on tap. Besides Russian River's Supplication wild ale, this is the best beer i have ever experienced, hands down best Imperial Stout. Reviewing from good notes on Black Tuesday - really wish I could get a bottle of this!! Appearance: Poured black, sucking in the ambient light and showing a mocha head, tight carbonation. Aroma: vanilla, freshly baked - toasted biscotti, some oak, roasted coffee, some dark fruit - cranberry and currants come to mind, roasted pecans. Taste: is creamy mocha, vanilla, and oaky bourbon. So well balanced it's sick. Mouthfeel: is smooth, chewy, but lends a pleasant viscosity. Drinkability: Not fusel at all, Black Tuesday is 19.5% but drinks like 9%. So beautifully executed. Patrick is a pioneer and a true alchemist - blending art and science into something that really speaks volumes of American ingenuity. If this couldn't get any better The Bruery, celebrated the event with Chocolate Rain (Black Tuesday W/ Vanilla Bean Cocoa Nibs)! Wow, sounds completely insane! 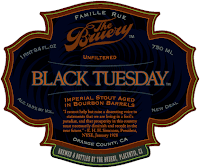 The Bruery - Black Tuesday from benjamin weiss on Vimeo. This is an extension of a monthly beer column for VIP Magzine. The Brew Review is a nudge for someone to break away from his or her tried and true brand time after time at the liquor store or at a restaurant. As an avid homebrewer, I see beer as an extension of cooking. Beer is a fun, carbonated, food that deserves respect in the fridge and at the dinner table. It works contrastively like wine but also pairs harmoniously with a depth of almost any conceivable flavor and aroma, like dark roasted espresso, flowery citrus, acidic sour notes and even bubblegum. Expanding one’s perception of food and beer will not only get you out of a gustatory rut but will guarantee to enhance life’s subtleties. Cheers!